I love birding in large part because it takes me to so many weird places. This time, in early June, it was the empty parking lot of a bankrupt ski resort in the dead of night. We needed to be at the top of the mountain at dawn in order to have a chance to see the rare Bicknell’s Thrush, and we had to get there on foot. We were at the base of Saddleback Mountain, Maine’s seventh-tallest and one of the highest stretches of the Appalachian Trail as it winds through the Longfellow Mountains towards Katahdin. A lack of consistent snow and the mountain’s remote location combined to close the resort, and so even in summer the place felt extra-deserted — which was just fine for the birds and us. The Bicknell’s Thrush is probably Maine’s rarest breeding bird (indeed, one of the rarest breeding birds in the country). Its appearance isn’t particularly unique: Bicknell’s are robin-sized, with a brown head and back and brown spots on a white chest, similar plumage to more familiar Catharus thrushes like Wood Thrush and Hermit Thrush. A rare Bicknell’s thrush by Ian Davies / Macaulay Library at the Cornell Lab of Ornithology. Its preferred habitat and habits, though, are unusual. Bicknell’s breed exclusively in inhospitable, at-treeline forests in New England and Atlantic Canada. There are only a few mountains in Maine with suitable habitat, and Saddleback, with its wide, grassy trails, is the easiest to climb. Oh — and there’s the dawn thing, too. To tell a Bicknell’s Thrush apart from the almost-identical Gray-cheeked Thrush, you need to hear its song. Gray-cheeked Thrush also breed on Saddleback Mountain, but Bicknell’s only sing at dawn to dusk, and from the top of the mountain. So there we were, parked at the trailhead at 1 a.m., ready to hike Saddleback after grabbing a few hours of sleep in the car. We began hiking around 4 a.m., and fueled by urgency and donuts, the hike went quickly. There wasn’t much to see at that time of morning, and so we mostly just kept our heads down and focused on our burning legs and lungs. Even before we started birding, the sunrise was our reward. It streamed across Rangeley Lake and an unbroken expanse of rolling greenery. We enjoyed it for a moment, but then shut our eyes tight. If we wanted to find the Bicknell’s, we would need to hear it. There were lots of great birds singing. Breeding season was in high gear, and many species were vociferously attracting mates or defending territories. Least Flycatchers “che-beck”-ed from the low branches, while Winter Wrens rang their impossibly fast whistle from the forest floor. Freshly arrived from their Central and South American wintering grounds, warblers including Nashville, Black-throated Green, Yellow-rumped, Blackpoll, and American Redstart all added their unique songs to the symphony. One song stood out. From the fluted pitch and staccato cadence, we could tell it was a thrush, but it sounded different: electrified and wiry. It wasn’t a song we had heard before, but we knew it was a Bicknell’s. We followed the song and found the bird perched calmly on a shaded branch. After all that planning, and driving, and sleeping in the car and then hiking, we were face-to-face with one of the rarest birds in the country. We high-fived and ate another donut. The sun shone brightly for the entire trip home. Check out Nick Lund’s NPR interview on Maine’s state bird. Nicholas Lund lives and birds in southern Maine. He is the outreach and network manager for Maine Audubon and manages The Birdist blog. 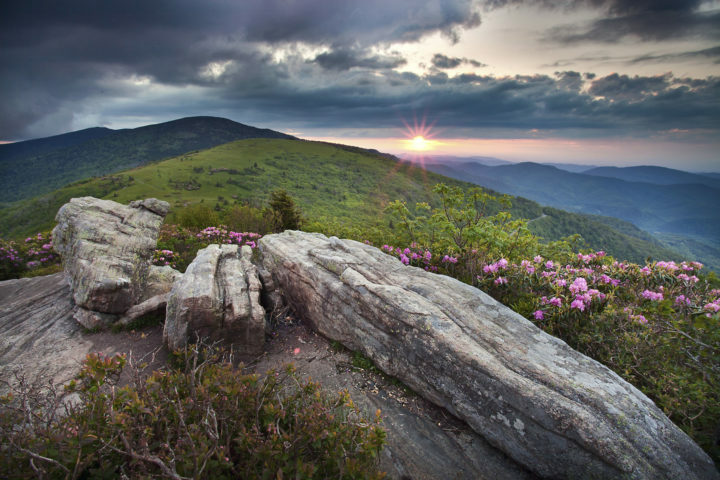 The iconic bald mountains along the Appalachian Trail in North Carolina and Tennessee are significant to the future of migratory and resident birds. The 125 miles of the Appalachian Trail that follow Pennsylvania's Kittatinny Ridge see an incredible amount of hawk and eagle migrations.